4 Department of Orthopaedic and Traumatology, Republic of Turkey, Ministry of Health, State Hospital, Corlu, 59850, Tekirdag, Turkey. 6 Department of Orthopaedic and Traumatology, Acibadem Hospitals Group, Kadikoy, 34718, Istanbul, Turkey. © 2017 Gumustas et al. Osteochondral injuries constitute an entity that is widespread and can be seen in patients of all ages. Actual treatment modalities aim to relieve pain, obtain full range of movement of the joint, and improve the quality of life. There are many slow-acting chondroprotective agents prevalently used in the United States that are classified as nutritional support but not as medicines . 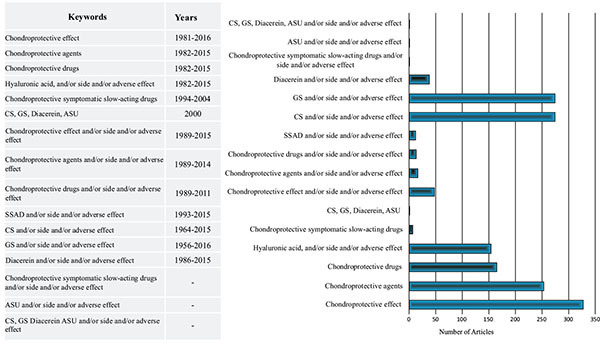 This study presents the importance of clinical adverse effect profiles as well as the pharmacological mechanism of action and application of combinations of drugs that are widely prescribed and not subjected to control. Electronic databases were searched with keywords about the chondroprotective drugs without any language restriction. Evaluations of the descriptive statistics were represented via Microsoft Office Excel 2010 lists in the form of a mean±standard deviation or frequency (%). The first evaluation showed that 1502 studies were potentially relevant. Following exclusion of the 1277 studies which were not clinical, full versions of the remaining 225 studies were subjected to further evaluation. No controlled, blinded, randomized and/or comparative studies met the inclusion criteria of the study, and no studies evaluated the comparative clinical results of the hyaluronan of different molecular weights. The findings of this study concluded that especially when prescribing drugs with ingredients like GS and CS, many patients’ pre-existing conditions must be considered, such as whether the patient has a glucose intolerance or not. Additionally, mineral toxication should be considered since the drugs contain minerals, and after the application of injected hyaluronan, complications should be considered. Clinical, controlled and comparative studies about the use of chondroprotective drugs must be performed to define the benefits of these drugs, if any, in order to determine the most suitable time for operative intervention. Keywords: Adverse effects, Cartilage, Chondroitin sulphate, Glucosamine sulphate, Hyaluronic acid, Symptomatic slow-acting chondroprotective drugs. Osteochondral damage may develop in articulations in all life cycles due to congenital, traumatic, vascular, degenerative, infective, inflammatory and metabolic diseases [1, 2]. Many experimental studies exist for treatments to repair osteochondral damage. These treatments not only aim to make patients capable of accomplishing daily tasks, but also to improve patient’s quality of life during early term. While choosing appropriate treatment methods, specific patient information must be considered to choose the most effective treatment method with the lowest cost [1-6]. Most preferred treatments focus on controlling pain, eliminating movement restriction and increasing quality of life. To this end, analgesics, non-steroid anti-inflammatory drugs, intraarticular (IA) injections that do not contain steroids and physical and rehabilitation methods are most common. Moreover, the use of pharmacologic agents applied as viscosupplementation that are symptomatic and slow-acting, such as autologous platelet-rich plasma and/or hyaluronic acid (HA), have been increasing [7-10]. Condroprotective agents are pharmaceutical products that have not been classified as drugs in many countries, including the United States. They have been classified as food supplements and have not been tested by many institutions, except the American Food and Drug Administration. Notwithstanding, they are frequently prescribed for patients by doctors with the purpose of relieving the pain. Patients who take food supplements and/or modifying osteoarthritis drugs without doctor’s advice may experience various undesirable effects frequently seen in drug-drug and drug-nutrition interaction, due to unknown and uninvestigated side effects of the drugs. As long as these drugs cannot be prescribed by clinicians, evaluating positive and/or negative side effects is not possible. As research regarding condroprotective drugs is limited and the undesired effect profile is not complete, doctors must use cost-effective treatments that can result in morbidity or mortality and other unforeseen results. In the present systematic review, studies regarding symptomatic slow-acting chondroprotective drugs which are widely used yet uncontrolled were investigated. The study aimed to consider pharmacologic effect mechanism and application combinations, emphasizing side effect and/or adverse effect profiles that may occur after patients use chondroprotective without any prescription from a doctor. Electronic databases such as US National Library of Medicine National Institutes of Health (NLM) (PubMed), Embase, OVID and Cochrane Library were searched from the year 1956 to January 22, 2016 using keywords such as “chondroprotective effect,” “chondroprotective agents,” “chondroprotective drugs,” “chondroprotective symptomatic slow-acting drugs,” “chondroitin sulphate (CS),” “glucosamine sulphate (GS),” “diacerein,” “avocado and soya unsaponifiables (ASU)” and “hyaluronic acid (HA),” along with “side effect” or “adverse effect” (Fig. 1). Studies by Lijmer et al. [11, 12] were used to determine the proof level of the studies. All bibliographies were also reviewed and reference lists were re-evaluated to find appropriate articles. Unpublished works were not included in the study. Comments, letters, editorials, protocols, guides, meta analyses and compilation works were excluded. Most cited studies were found in Web of Science and Scopus. All references and citations were examined to avoid repetition. Fig. (1). Scanning Process. The symbolizes are as follow: CS: chondroitin sulfate; GS: glucosamine sulfate; SSAD: symptomatic slow-acting drugs; HA: hyaluronic acid; ASU: avocado and soya unsaponifiables. The studies which were not clinical, controlled, blind and non-comparative concerning CS, GS, diacerein, ASU, and HA were not included. References were selected independently by all authors. Selection bias from potential masking was extensively monitored. With the aim of providing verification, all references were examined by each author. In the cases when at least two authors did not reach a consensus, the senior author examined the case(s). The evaluation of data and descriptive statistics were processed using Microsoft Excel lists (Microsoft Office 2010 program) as mean±standard deviation or frequency (%). After the first evaluation of sources, 1502 studies were found to be potentially related. Further, 1277 nonclinical studies were excluded, and 225 articles were excluded because they did not match the inclusion criteria (controlled, blind, randomized and/or comparative). Treatment expenses for osteoarthrosis patients are high . Current treatment methods to avoid osteoarthrosis damage are growth factors, anticytokines, anti-inflammatory drugs and stem cell-based treatment strategies. Among these treatments, stem cell-based treatments place the greatest burden on the health economy . Research shows that cartilage tissue similar to hyaline cannot be obtained . Independent studies carried out in small sampling and research groups due to economic and time constraints regarding GS, CS, HA, ASU, symptomatic slow-acting chondroprotective drugs, and diacerein pharmacologic treatment protocols have been increasing. Because there are so many differences emerging in the available research, researchers have begun to work together when gathering data . The present systematic review aims to uncover pharmacologic effect mechanisms, clarify side/adverse effect profiles and evaluate clinical importance of symptomatic slow-acting chondroprotective drugs. Data obtained from different resources will be transformed into the same effect size. Then, the effect size of the studies included in the analysis is calculated . In addition, this study tests whether effect size is distributed homogeneously. As a result, if effect size shows a homogeneous distribution, the fixed effect model should be used; otherwise, the random effect model should be used [17-20]. There were few to no clinical studies found meeting inclusion criterion with high proof value. For this very reason, effect size or homogeneity tests were not performed. This is the limitation of this study. However, the present study still encompasses the first studies where CS, GS, diacerein, and ASU were evaluated together along with side/adverse effects. Research shows that HA, which was isolated from swine vitreous humor, has positive biochemical effects on cartilage cells, and its half-life in cartilage tissue was 2-3 weeks [21, 22]. HA, or hyaluronan, is the only linear polysaccharide which does not contain a sulfate group among glucuronic acid groups as a result of glycosidicality . HA does not have drug-nutrition interaction, and it does not cause adverse reactions except in cases involving chicken allergies . HA molecule weight is 4-5 dalton in an ordinary joint. The average hyaluronan amount is 4-8 mg in joints and 0,35gr/100ml concentration in joint liquid . It is mentioned that erosive effect could be limited in joints by means of HA treatment . HA is recommended for early cases when NAID is contraindicated, not tolerated, and corticosteroids are ineffective . In the limited studies concerning osteoarthritis viscosupplementation treatment, it is indicated that HA has healing effects in dry joints due to its its lubricant characteristic . It is reported that patients protected by medium grade morphological changes and who have joint spacing respond to the treatment better, and the results of advanced osteoarthritis cases are more limited. HA is effective in knee osteotrite, which is resistant to conventional treatments, but is promising in other joint applications. It is reported that HA has long standing positive effects despite its half-life. Long lasting effects result from recovery of lubricity and elasticity with its chemical structure, reconstruction of “viscosupplementation” or joint rheology, observation of anti-inflammatory and antinociceptive effects, normalization of endogeny HA synthesis and protection of cartilage such as “biosupplementation” characteristics [26-30]. In a randomized study in which there were 4866 patients, HA was evaluated between the fourth and 13th weeks as well as the 14th and 26th weeks concerning knee pain and functionality. When cases were compared with the values before HA injection, improvements in knee pain and functionality were observed . In studies regarding intraarticular HA application, it is reported that HA does not outclass corticosteroid applications and may be effective on regeneration of chondrocyte along with its analgesic features. In addition to contradictory results, it is indicated that IA HA injections, which are repeatedly applied, do not affect the OA process or not slow down. After injections, intrapelvic abscess and septic arthritis cases were discovered . It has been proven through an in-vitro clinical studiy that biological activity is better in terms of high molecular HA preparates in-vitro environments, as high molecular weight showed a better performance [31, 32]. Preference of high molecular HA to low molecular HA is controversial. Diacerein is in 4,5-diacetoxy-9,10-diokso-anthracene-2-carboxylic acid structure as a chemical called diacetilrein. This pharmaceutic agent plays a role in destruction of the cartilage, synovial inflammation and transformation of the subchondral bone. Diacetilrein is an inhibitor of interleukin beta (IL-1β), which could trigger the production of many pre or pro-inflammatory factors, including cytokines, cyclooxygenasei, prostaglandins, nitric oxide and matrix metalloproteinases [33, 34]. Diacerein, which is taken orally with systemic action, arrives at hepatic passing, and is diacetyled to rhein and absorbed before it circulates. After 100 mg Diacerein is taken as a single dose, free rhein plasma value was only 8-10 g/ml [34-36]. Diacetilrein is not appropriate for those who have hypersensitivity to Diacerein, anthraquinone derivatives and excipients, or for those with hepatic deficiency, inflammatory bowel disease and intestinal obstruction. Furthermore, its use is contraindicated for those under 18 years old along with those who are pregnant or breastfeeding. Antacids obtained from magnesium, aluminum and calcium may reduce absorption of diacerein from digestive system. Therefore, there should be at least two-hours-time interval between the use of diacerein and preparates containing diacerein. It was observed that when diacerein is used concomitant with warefarin, phenytoin, indomethacin, paracetamol, salicylic acid, glibenclamide, hydrochlorothiazide, cimetidine and anti-inflammatory drugs that are not in steroid structure, there was no pharmacologic interaction. However, in 2014, the European Medicines Agency reported that diacerein causes severe diarrhea . In studies which were carried out in-vitro, diacerein was shown to stimulate cartilage growth factors, such as transformer growth factor-beta1 (TGF-β1), even in the presence of IL-1β, as well as to stimulate the syntheses of components of cartilage matrix, such as glycosaminoglycan and HA [38, 39]. It is reported that GS, 2-amino-2-deoxy-beta-D-glucopyranose, and CS, 2-amino-2-deoksi-D-glukoz sulphate, contain a wave sugar chain in N-acetylgalactosamine and glucuronic acid structure . In pharmacokinetics studies involving human and experimental living mammals, it was reported that single dose 300 mg CS was absorbed by first degree kinetics after being taken orally. It was also emphasized that when it is applied in OA cases as 800 mg multiple doses, its kinetics did not change and the effect was the same . In a study about the reliability and clinical activity of GS and CS in the cases with knee OA, it was found that when GS and CS were used alone or in combination, they were as effective as celecoxib and placebo groups . Additionally, CS, which does not interact with liver cytochrome p450 enzyme, does not have medication-medication interaction and can be used together with the drugs used in the treatment of hypertension, hyperlipidemia and diabetes [43, 44]. It is reported that there are effect mechanisms that are not very clear in the way that ASU stimulates TGF-β1 and may stimulate matrix synthesis of chondrocyte due to reduction of matrix metalloproteinase production. In chondrocytes, production of the extracellular matrix is stimulated, such as type II collagen and proteoglycans. Although a study indicates that chondrocytes increase TGF- β1 and TGF- β2 levels in knee joint in dogs, its effect on full-thickness articular cartilage lesions is not revealed in clinics .
. Maheu et al report that joint spacing progress decelerated in a controlled study in which they evaluated 399 cases with symptomatic hip OA for three years . When treatment-resistant OA cases are older and multiple drugs have been used, treatment possibility becomes more difficult. As a result of this, these cases lean towards alternative treatment methods. Absorption speed and medication rates in older cases may differ. In older cases where the absorption rate slows down, the total body water and lean body weight decrease, and body fat increases. For this very reason, while the volume of distribution in medications with high diluent in fat increases, volume of distribution of hydrophilic medications decreases. Also, it is observed that total plasma protein does not change and albumin fraction decreases in older cases. Due to decreased albumin concentration, free medication levels in plasma increase when medications that affect binding proteins are used in older cases. Moreover, they compete with each other in order to bind protein due to multiple medications, which increases the risk of side effect presence [47-49]. Additionally, older cases also experience changes in the number and affinity of receptors, secondary message systems and cell response. Chronic illnesses that increase as people get older augment medication is needed, leading to side/adverse effects, drug-drug interaction and drug-nutrition risks [47-49]. As a result, because these drugs may contain inactive ingredients such as lactose, it may not be safe to prescribe these medications to patients with lactose intolerance. In drugs, in which GS and CS are combined, there is low level of manganese. In patients who consume cereals, rice, soya bean, egg, hazelnut, olive oil, green bean and oysters, there may be an accumulation of drugs in the liver, kidney, pancreas, endocrine glands, respiratory tract and brain after manganese absorption. Manganese is toxic in high concentrations. Due to manganese accumulation, muscle weakness, headache and insomnia may occur in addition to the increase in psychotic illnesses and malignites. One of the limitations of this research is publication bias as a result of reviewed studies. Another limitation is that the studies available for review contain data obtained from previous studies. When the studies under review were performed earlier, it is not possible to make an amendment for them. As a result, in this study, 225 articles were not found to be inclusive, as clinical investigations were not carried out where molecular weight of hyaluronic acid was compared. There wasn’t a study regarding long term follow-up results after the use of these prescribed pharmaceuticals. Additionally, many patients in previous studies were prescribed without considering whether they were diabetic or glucose intolerant. It was also discovered that toxication due to the accumulation of manganese was not considered. Previous studies lack discussion or evidence regarding postponement of treatment or needlessness of surgery after the use of slow-acting symptomatic chondroprotective drugs. Some further studies will be performed where long term results of slow-acting/symptomatic chondroprotective are considered and side and/or adverse effects are compared. Afterwards, exact information is to be put forward regarding conservative and surgical treatment timing. Guler O, Isyar M, Karataş D, Ormeci T, Cerci H, Mahirogulları M. Investigating the relationship between internal tibial torsion and medial collateral ligament injury in patients undergoing knee arthroscopy due to tears in the posterior one third of the medial meniscus. Knee 2016; 23(4): 655-8. Isyar M, Yilmaz I, Nusran G, Guler O, Yalcin S, Mahirogullari M. Safety of bioabsorbable implants in vitro. BMC Surg 2015; 15: 127. Dogan M, Isyar M, Yilmaz I, et al. Are the leading drugs against Staphylococcus aureus really toxic to cartilage? J Infect Public Health 2016; 9(3): 251-8. Isyar M, Bilir B, Yilmaz I, et al. Are biological agents toxic to human chondrocytes and osteocytes? J Orthop Surg 2015; 10: 118. Guzelant AY, Isyar M, Yilmaz İ, Sirin DY, Cakmak S, Mahirogullari M. Are chondrocytes damaged when rheumatologic inflammation is suppressed? Drug Chem Toxicol 2016; 1-11. Isyar M, Gumustas SA, Yilmaz I, Sirin DY, Tosun HB, Mahirogullari M. Are we economically efficient enough to increase the potential of in vitro proliferation of osteoblasts by means of pharmacochemical agents? Open Orthop J 2016; 10: 420-30. Bashaireh K, Naser Z, Hawadya KA, Sorour S, Al-Khateeb RN. Efficacy and safety of cross-linked hyaluronic acid single injection on osteoarthritis of the knee: a post-marketing Phase IV study. Drug Des Devel Ther 2015; 9: 2063-72. Campbell KA, Erickson BJ, Saltzman BM, Mascarenhas R, Bach BR Jr, Cole BJ, et al. Arthroscopy. Is local viscosupplementation injection clinically superior to other therapies in the treatment of osteoarthritis of the knee: a systematic review of overlapping meta-analyses 2015; 31(10): 2036-45. Kosinska MK, Ludwig TE, Liebisch G, et al. Articular joint lubricants during osteoarthritis and rheumatoid arthritis display altered levels and molecular species. PLoS One 2015; 10(5): e0125192. Lijmer JG, Mol BW, Heisterkamp S, et al. Empirical evidence of design-related bias in studies of diagnostic tests. JAMA 1999; 282(11): 1061-6. Ali G. S, Isyar M, Topuk S, et al. Systematic evaluation of drug-loaded hydrogels for application in osteosarcoma treatment. Curr Pharm Biotechnol 2016; 17(10): 866-72. Guo X, Ma WJ, Zhang F, Ren FL, Qu CJ, Lammi MJ. Recent advances in the research of an endemic osteochondropathy in China: Kashin-Beck disease. Osteoarthritis Cartilage 2014; 22(11): 1774-83. Hunziker EB, Lippuner K, Keel MJ, Shintani N. An educational review of cartilage repair: precepts-progress&prospects. Osteoarthritis Cartilage 2015; 23(3): 334-50. Doral MN, Atay A, Bilge O, Dönmez G, Üzümcügil A, Olgun D, et al. Current surgical treatment options for cartilage repair. Turk Geriatri Derg 2011; 4: 95-100. Bernard RM, Abrami PC, Lou Y, Borokhovski E, Wade A, Wozney L, et al. How does distance education compare with classroom instruction? A meta-analysis of the empirical literature. Rev Educ Res 2004; 74(3): 349-61. Berman NG, Parker RA. Meta-analysis: neither quick nor easy. BMC Med Res Methodol 2002; 2(2): 10. Abramson JH. Making Sense of Data 2nd ed. 1994; 404. Cohen J. Statistical power analysis. Curr Dir Psychol Sci 1992; 1(3): 98-101. Mei-Dan O, Kish B, Shabat S, et al. Treatment of osteoarthritis of the ankle by intra-articular injections of hyaluronic acid: a prospective study. J Am Podiatr Med Assoc 2010; 100(2): 93-100. Weiss C, Band P. Musculoskeletal applications of hyaluronan and hylan. Potential uses in the foot and ankle. Clin Podiatr Med Surg 1995; 12(3): 497-517. Micheels P. Human anti-hyaluronic acid antibodies: is it possible? Dermatol Surg 2001; 27(2): 185-91. Gur S, Dabak KT. Conservative treatment in cartilage. Turkiye Klinikleri J Surg Med Sci 2006; 2: 57-60. Waddell DD. Viscosupplementation with hyaluronans for osteoarthritis of the knee: clinical efficacy and economic implications. Drugs Aging 2007; 24(8): 629-42. Brocq O, Tran G, Breuil V, et al. Hip osteoarthritis: short-term efficacy and safety of viscosupplementation by hylan G-F 20. An open-label study in 22 patients. Joint Bone Spine 2002; 69(4): 388-91. Hunter DJ, Lo GH. The management of osteoarthritis: An overview and call to appropriate conservative treatment. Rheum Dis Clin North Am 2008; 34(3): 689-712. Hiraoka N, Takahashi KA, Arai Y, et al. Intra-articular injection of hyaluronan restores the aberrant expression of matrix metalloproteinase-13 in osteoarthritic subchondral bone. J Orthop Res 2011; 29(3): 354-60. Russo A, Arrighi A, Vignale L, Molfetta L. Conservative integrated treatment of adhesive capsulitis of the shoulder. Joints 2014; 2(1): 15-9. El-Refaie WM, Elnaggar YS, El-Massik MA, Abdallah OY. Novel self-assembled, Gel-core hyaluosomes for non-invasive management of osteoarthritis: In-vitro optimization, Ex-vivo and In-vivo permeation. Pharm Res 2015; 32(9): 2901-11. Julovi SM, Ito H, Nishitani K, Jackson CJ, Nakamura T. Hyaluronan inhibits matrix metalloproteinase-13 in human arthritic chondrocytes via CD44 and P38. J Orthop Res 2011; 29(2): 258-64. Migliore A, Tormenta S, Martin Martin LS, et al. The symptomatic effects of intra-articular administration of hylan G-F 20 on osteoarthritis of the hip: clinical data of 6 months follow-up. Clin Rheumatol 2006; 25(3): 389-93. Pelletier JP, Martel-Pelletier J, Raynauld JP. Most recent developments in strategies to reduce the progression of structural changes in osteoarthritis: today and tomorrow. Arthritis Res Ther 2006; 8(2): 206. Shin K, Kim JW, Moon KW, et al. The efficacy of diacerein in hand osteoarthritis: A double-blind, randomized, placebo-controlled study. Clin Ther 2013; 35(4): 431-9. Elsayed I, Abdelbary AA, Elshafeey AH. Nanosizing of a poorly soluble drug: Technique optimization, factorial analysis, and pharmacokinetic study in healthy human volunteers. Int J Nanomedicine 2014; 9: 2943-53. Fidelix TS, Soares BG, Trevisani VF. Diacerein for osteoarthritis. Cochrane Database Syst Rev 2006; 25(1): CD005117. EMA. CMDH. 21 March 2014! http://www.ema.europa.eu/docs/ en_GB/document_library/ Referrals_document/Diacerein/ Position_provided_by_CMDh/ WC500163532.pdf. Assirelli E, Filardo G, Mariani E, Kon E, et al. Effect of two different preparations of platelet-rich plasma on synoviocytes. Knee Surg Sports Traumatol Arthrosc 2015; 23(9): 2690-703. Jung H, Kim HH, Lee DH, et al. Transforming growth factor-beta 1 in adipose derived stem cells conditioned medium is a dominant paracrine mediator determines hyaluronic acid and collagen expression profile. Cytotechnology 2011; 63(1): 57-66. Baeurle SA, Kiselev MG, Makarova ES, Nogovitsin EA. Effect of the counterion behavior on the frictional–compressive properties of chondroitin sulfate solutions. Polymer (Guildf) 2009; 50(7): 1805-13. Ronca F, Palmieri L, Panicucci P, Ronca G. Anti-inflammatory activity of chondroitin sulfate. Osteoarthritis Cartilage 1998; 6(Suppl. A): 14-21. Sawitzke AD, Shi H, Finco MF, et al. Clinical efficacy and safety of glucosamine, chondroitin sulphate, their combination, celecoxib or placebo taken to treat osteoarthritis of the knee: 2-year results from GAIT. Ann Rheum Dis 2010; 69(8): 1459-64. Hathcock JN, Shao A. Risk assessment for glucosamine and chondroitin sulfate. Regul Toxicol Pharmacol 2007; 47(1): 78-83. Andermann G, Dietz M. The influence of the route of administration on the bioavailability of an endogenous macromolecule: chondroitin sulphate (CSA). Eur J Drug Metab Pharmacokinet 1982; 7(1): 11-6. Altinel L, Saritas ZK, Kose KC, et al. Treatment with unsaponifiable extracts of avocado and soybean increases TGF-beta1 and TGF-beta2 levels in canine joint fluid. Tohoku J Exp Med 2007; 211(2): 181-6. Maheu E, Cadet C, Marty M, et al. Randomised, controlled trial of avocado-soybean unsaponifiable (Piascledine) effect on structure modification in hip osteoarthritis: the ERADIAS study. Ann Rheum Dis 2014; 73(2): 376-84. Merchant HA, Liu F, Orlu Gul M, Basit AW. Age-mediated changes in the gastrointestinal tract. Int J Pharm 2016; 512(2): 382-95. Jansen PAF, Brouwers RBJ. Clinical Pharmacology in Old Persons 2012. McLachlan AJ, Bath S, Naganathan V, et al. Clinical pharmacology of analgesic medicines in older people: impact of frailty and cognitive impairment. Br J Clin Pharmacol 2011; 71(3): 351-64.